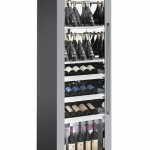 With improved lighting, the Miami unit offers the ultimate wine bottle display. LED lights are embedded all along the front door frame and the internal mirror walls create depth and pleasant lighting effects, while enhancing the visibility of wine bottles. 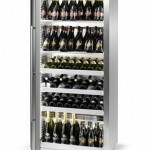 Energy consumption is significantly reduced given the LED lighting and a new refrigeration system, which is controlled by an automatic device that enhances its efficiency. The product’s insulation is improved by 60mm thick panels. The door is made of 20mm thick low emission double-glazing glass. The glass panel is embedded in a frame with magnetic gaskets. 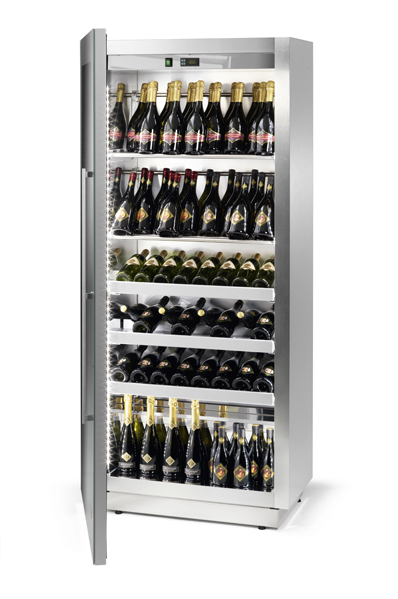 Inside the unit, the arrangement of bottles is entirely adjustable. It is possible to insert steel tubes, elegant pull-out wood drawers or steel shelves. LED lighting along perimeter of the door, combined with the mirror effect of the internal walls, ensure the ultimate bottle display. 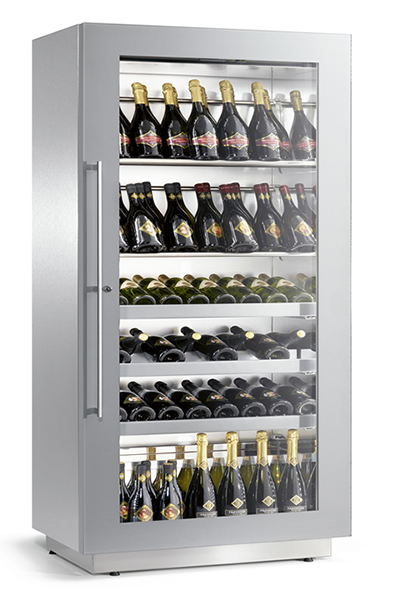 The innovative static refrigeration system ensures the right temperature without the need for an evaporator. 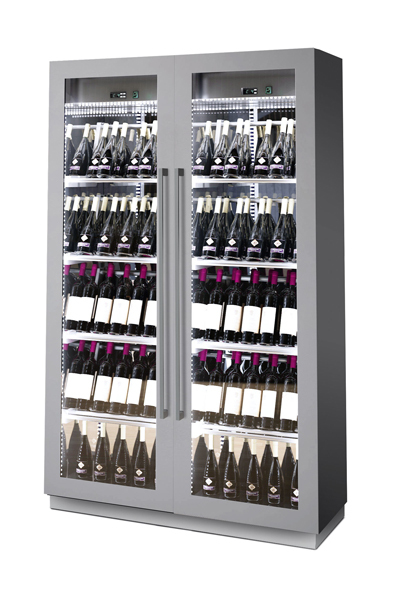 The bottle capacity is increased and the mirrored internal walls provide a 360° view effect. Different size options are available to suit any customer’s needs. The static condensation system is designed to provide maximum noise reduction of the refrigeration equipment. The wood laminate is available in semi-glossy black and brushed aluminium grey. Other colour options are available upon request. 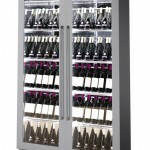 Up to 50% less energy consumption in comparison to traditional wine cabinets due to the LED lighting, 60mm thick insulation and the low emission double glazing glass door. 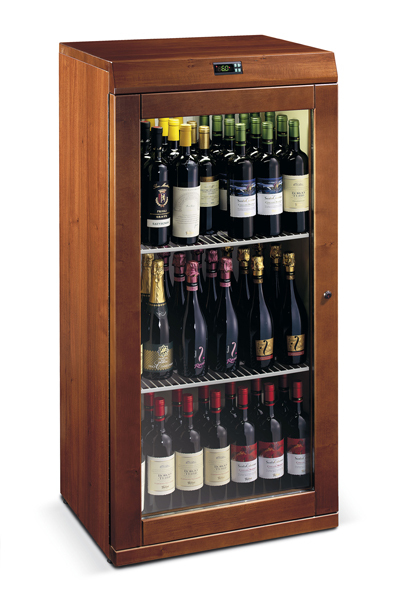 Bottles can be displayed vertically (stainless steel shelves), on an incline (stainless steel tubes) or horizontally (pull-out wood drawers), according to individual preferences. 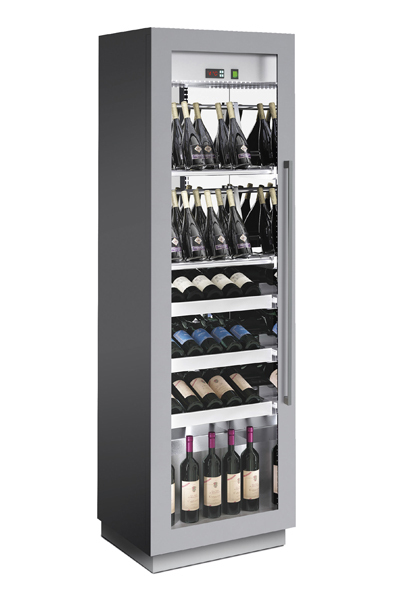 The static refrigeration operating mode provides four different temperature zones in one unit. 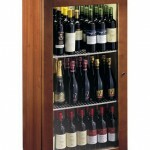 Both red and white wines can be maintained at the most suitable temperature. 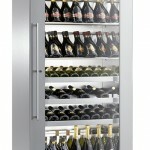 The fan assisted refrigeration optional version, allows to choose the favourite internal uniform temperature set. The temperature can be set anywhere from 6°C to 20°C.